This entry was posted in Amateur Radio Useful Links, Events, GB4TBL, SES, SOS Radio Day, SOS Radio Week on 28/01/2012 by G2DXU. GB2RS announces our special event station in support of the RNLI. This entry was posted in Amateur Radio Useful Links, Events, GB4TBL, SES, SOS Radio Day, SOS Radio Week and tagged GB2RS, GB4TBL, Riviera ARC, RSGB, SOS Radio Week, Torquay on 23/01/2012 by G2DXU. Here is a new QSL card for the GB4TBL special event station. It may not be the final version. The photo is of Torbay Lifeboat at Brixham, Devon, England and was taken by Alan G2DXU on 9th January 2012. 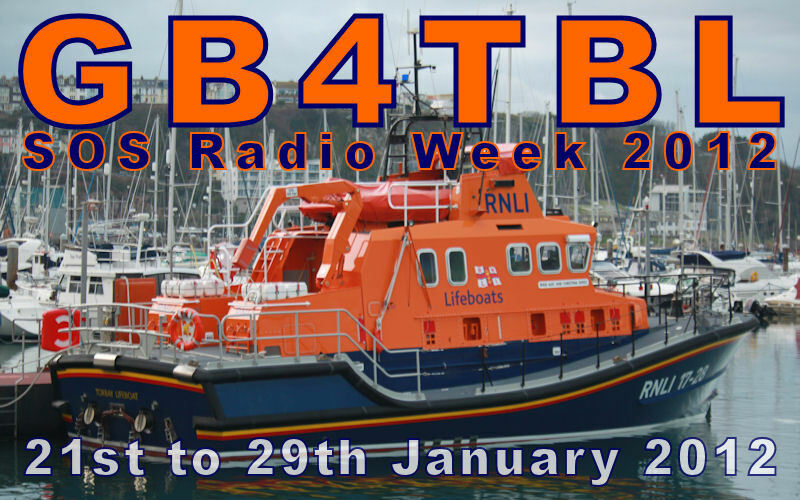 This entry was posted in Events, GB4TBL, QSL, Riviera ARC, SES, SOS Radio Day, SOS Radio Week, Uncategorized and tagged Amateur Radio Useful Links, Brixham, GB4TBL, lifeboat, QSL, Riviera ARC, RNLI, SES, SOS Day, SOS Radio Week, Torbay lifeboat on 09/01/2012 by G2DXU.